SoundFly BT and SoundFly Air speakers are wall warts for audio. JBL makes two nearly identical speakers, with names that highlight their key difference: the $200 $63.00 SoundFly Air lets you stream audio to the speaker using Apple’s AirPlay technology, while the $180 SoundFly BT uses Bluetooth, instead. With the exception of that core, but outwardly invisible, difference, the two SoundFly speakers are nearly identical. Each is small and white with a fabric grille (lighter gray on the BT, darker gray on the Air), and each is designed to plug directly into a wall outlet. In other words, the speaker is its power cord and power brick: You plug the whole shebang into the wall. The speakers are designed to throw their sound upward, so they should work even with outlets positioned closer to the floor. Each SoundFly ships with the appropriate plug adapters for your country—in the U.S., you get both two- and three-prong plugs—and each measures 7.5 inches wide, 2.8 inches tall, and 3.6 inches deep and weighs slightly less than one pound. Both SoundFly models have a pair of touch-capacitive buttons. The first is actually integrated into the JBL logo in the center of the speaker grille and acts as a power button. On the SoundFly BT, the button simply toggles power on and off. On the SoundFly Air, pressing the power button briefly puts the speaker to sleep; you can wake it by either pressing the button again or by sending AirPlay audio to it. Pressing and holding the Air’s power button for three seconds puts the unit into Eco-Standby mode, from which you must manually wake it up by pressing the button again. Both SoundFly models automatically go to sleep after ten minutes of inactivity. Unlike most wireless speakers, both SoundFly models plug right into, and hang from, your wall outlet. The second button, located on the front of each speaker (when plugged into a wall outlet), is speaker-specific: On the SoundFly BT, the button sports a blue Bluetooth logo for pairing the speaker with your Bluetooth devices. Rather than flashing a light, the BT uses a pre-recorded voice that announces when the speaker is in pairing mode and when it’s successfully paired. In my testing, pairing the SoundFly BT was a straightforward process. Alternatively, you can pop off the SoundFly Air’s grille to reveal a USB port, connect your iOS device’s charge/sync cable to that port, and then configure the speaker using JBL’s free app. (You can pop off the SoundFly BT’s grille, too, but there’s no USB port underneath.) 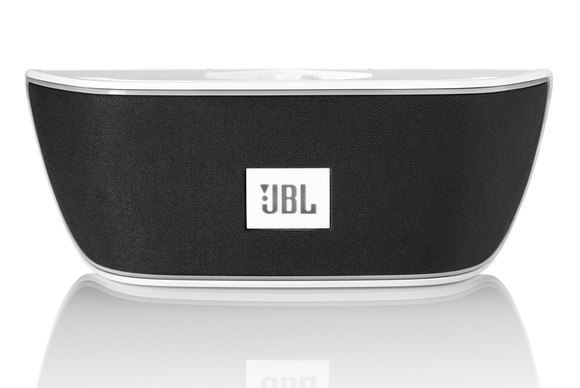 You can also use the free JBL app to adjust the virtual width of the Air’s stereo separation. Of course, since it uses AirPlay, the SoundFly Air requires a local Wi-Fi network. But though that network can be password protected, the SoundFly Air’s setup procedures can’t handle Web-based verification processes, like those used by many hotel networks. Which means that while both SoundFly units are small and light enough to toss in your bag, the BT version may be a better bet for travel. Though each SoundFly employs an identical pair of speaker drivers, they don’t sound the same: The SoundFly Air sounds slightly—but noticeably—better than its Bluetooth sibling, likely due to the fact that Bluetooth employs lossy compression to transmit audio, while AirPlay does not. That said, neither SoundFly speaker sounds great, though both sound passable. Audio often sound compressed, and both speakers lack bass presence—with no significant lower-end presence, the speakers simply lack auditory oomph. On the other hand, both SoundFly speakers are capable of filling a small room with sound, and that sound is much, much louder and far less muddled than your source device could generate on its own. JBL’s SoundFly speakers are uniquely portable: They don’t run off battery power, but thanks to their plug-right-into-the-wall design, they’re small and light enough to take wherever you’ll have power. Though they lack powerful sound, they sound just fine for casual listening, and their lack of cables and adapters is convenient. If you’ll be listening exclusively to Apple devices—and, more important, you’re typically in range of a Wi-Fi network—spring for the SoundFly Air version, which sounds a bit better; otherwise, you’ll want to go with the SoundFly BT. This entry was posted in Apple news and tagged air play, Air Play Speaker, iRumors Store, iStore, JBL, SoundFly. Bookmark the permalink. Apple now producing music videos for Apple Music stars. The truth about HackingTeam, jailbreaking and iOS – and how to keep your device safe.